← Ricoh Establishes PENTAX RICOH IMAGING COMPANY, LTD.
TOKYO-Nikon Corporation is pleased to announce the release of the first two models in the new Nikon 1 series, the J1 and V1. 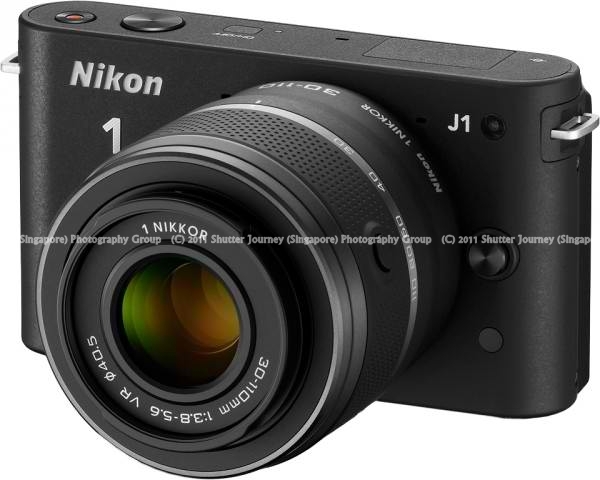 Nikon 1 is an advanced interchangeable lens that proposes new forms of imaging expression with a new super high-speed AF CMOS image sensor, the new high-speed image-processing engine, EXPEED 3, and the new Nikon 1 mount lens system. As a manufacturer of optical devices, Nikon has long developed products equipped with innovative new features based on technologies originally cultivated decades ago for film cameras. The many cameras released by Nikon over the years have continuously expanded photographic possibilities. Even with the nearly complete transition to digital that we see today, Nikon has continued to expand its lineups of compact digital cameras and digital-SLR cameras. Nikon’s COOLPIX-series cameras are user friendly compact digital cameras, while the D-series line of digital-SLR cameras supports the needs of an incredibly wide variety of photographer, from the beginner to the professional. Nikon will celebrate its 95th anniversary next year, and is extremely proud of its record of having utilized its optical technologies in the development of many innovative products over nearly a century. So that we may continue our role as a leading company in the imaging industry in this age when digital technologies have become so common, Nikon looks forward to proposing new forms of imaging enjoyment and value over the next century as well. The first step in this process has been the development of a new type of camera that creates new imaging possibilities never before considered with conventional compact digital cameras or digital-SLR cameras. The world’s smallest and lightest*1 interchangeable lens digital cameras that propose new forms of imaging expressionFaster image processing and superior reproduction characteristics have been achieved for both still images and movies through the combination of the CMOS image sensor and image-processing engine, both developed by Nikon. The cameras are also equipped with Nikon’s newest lens mount system. Despite the new lens mount, the mount adapter enables the use of existing F-mount NIKKOR lenses*2 with the J1 and V1, for excellent compatibility with equipment users may already own. Nikon 1 mount, Nikon’s new compact, high-performance lens mount systemThe Nikon 1 mount is the new lens mount system developed for compatibility with Nikon’s new imaging format. The new mount not only supports the dedicated 1 NIKKOR VR 10-30mm f/3.5-5.6, 1 NIKKOR VR 30-110mm f/3.8-5.6, 1 NIKKOR 10mm f/2.8 and 1 NIKKOR VR 10-100mm f/4.5-5.6 PD-ZOOM Nikon 1-mount interchangeable lenses, but also F-mount NIKKOR lenses*2, manufactured by Nikon for more than half a century, when the new FT1 mount adapter is used. This enables users to enjoy tremendous variety in their imaging expression with the ability to choose the lens best suited to the scene, subject, or their own creative intent from a broad lineup of standard and special-purpose lenses. The world’s first*3 cameras to be equipped with a new super high-speed AF CMOS image sensor and offer focal plane phase detection AFThe new super high-speed AF CMOS sensor is a Nikon CX-format CMOS image sensor. With the new CX format, Nikon has added a new imaging format to its existing Nikon FX and DX formats for digital-SLR cameras. The J1 and V1 are the world’s first interchangeable lens digital cameras equipped with focal plane phase detection AF*3 for the world’s fastest autofocusing*4. They offer standard sensitivities of ISO 100 to 3200, with the ability to further increase sensitivity to an equivalent of ISO 6400 with a Hi 1 setting. They also support matrix metering, center-weighted metering and spot metering. *2Autofocus may not perform as expected in some situations or with some lenses. Restrictions apply to mounting and functionality with some lenses. *4Among interchangeable lens digital cameras available as of September 21, 2011. Statement based on performance with shooting using the 1 NIKKOR VR 10-30mm f/3.5-5.6 at the maximum wide-angle position with AF-area mode set to Single-point. Results based on Nikon test conditions. New EXPEED 3 image processing engineThe cameras are equipped with Nikon’s latest image-processing engine, EXPEED 3, which is based on EXPEED, Nikon’s exclusive comprehensive image-processing concept, and optimized for the Nikon 1 system for increased speed and performance. Simple operation with compact and lightweight bodies that make them perfect for everyday useThe J1 and V1 are compact and lightweight cameras that you can keep with you at all times, making them perfect not only for vacations and special events, but also for quick and easy capture of everyday scenes or unexpected episodes. You can easily record photos or movies with four shooting modes (Motion Snapshot, Smart Photo Selector, Still image, Movie). A new advanced hybrid autofocus system that enables the world’s fastest autofocusing*1 with the world’s most focus points*2The advanced hybrid autofocus system combines phase detection AF, which enables faster focusing and superior subject tracking performance with moving subjects, with contrast-detect AF, which performs well in low-light conditions. This hybrid system ensures optimal focusing under a variety of shooting conditions. As the world’s first*1 interchangeable lens cameras to implement focal plane phase detection AF, the J1 and V1 have achieved the high-speed autofocusing needed for certain capture of even the most unexpected photo opportunities. This enables certain capture of the perfect photo opportunities when shooting moving subjects and subjects such as children and pets whose movement is very difficult to predict. What’s more, at 10 fps, the cameras also offer the world’s fastest continuous shooting rate*3 with AF tracking, and the world’s fastest high-speed continuous shooting rate*4 of 60 fps. The J1 and V1 also boast the most focus points*2—73 with phase detection AF—available with any interchangeable lens digital camera currently available. *1Among interchangeable lens digital cameras available as of September 21, 2011. Statement based on performance with shooting using the 1 NIKKOR VR 10-30mm f/3.5-5.6 at the maximum wide-angle position with AF-area mode set to Single-point. Results based on Nikon test conditions. Motion Snapshot, imaging function that combines full-HD movie with a still image for more dramatic imaging expressionIn Motion Snapshot mode, simply pressing the shutter-release button records a still image and about a second of high-resolution movie footage beginning before and ending after the time the shutter-release button was pressed. Movies recorded in Motion Snapshot mode are played back in slow motion. With slow-motion playback at 0.4x normal playback speed of the movie and a still image, Motion Snapshot allows users to express impressive moments that show slight changes in expression, the rustling of tree leaves, or fluctuations in nature.Shooting/recording: Choose one of four themes (Beauty, Waves, Relaxation, Tenderness) prior to shooting. When the shutter-release button is pressed halfway, the camera begins recording movie footage to the memory buffer. When the shutter-release button is pressed the rest of the way down, a still image, along with about a second of movie footage beginning before and ending after the time the shutter-release button was pressed, are recorded to the memory card.Playback: After approximately 2.5 seconds of movie footage recorded in Motion Snapshot is played back in slow motion, the still image is displayed. Total movie/still image display lasts for 10 seconds, during which time the background music for the selected theme is played. The movie file and still image file recorded each time the shutter-release button is pressed in Motion Snapshot mode are stored as a set on the memory card. This fun new feature enables a new form of imaging expression that combines both still images and movie footage using conventional shooting operations. Smart Photo Selector for simple capture of the best shotWhen the shutter-release button is pressed halfway in Smart Photo Selector mode, the camera focuses and begins buffering images. When the shutter-release button is then pressed the rest of the way down, the camera compares shots recorded to the buffer both before and after the shutter-release button was pressed, and automatically selects five to record to the memory card. It also eliminates the need for capturing a large volume of shots with continuous shooting and the troublesome process of later manually selecting the best shot from a series.Shooting/recording:Rotate the mode dial to Smart Photo Selector mode. When the shutter-release button is pressed halfway, the camera focuses and begins recording images to the buffer memory. Up to 20 images can be saved in the buffer memory each time the shutter-release button is pressed (some before the shutter-release button is pressed, some after). Of the 20 buffered images, the camera automatically records the single best shot based on movement and composition, as well as four additional candidate images to the memory card.Playback: Users can choose a different “best shot” than that selected by the camera from the candidate images, and also delete unnecessary images. 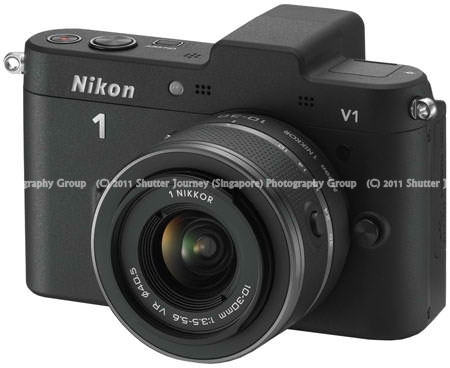 A simple, high-quality designThe concepts of simple, streamlined, fashionable and high-quality were adopted for design of both the Nikon 1 J1 and V1. 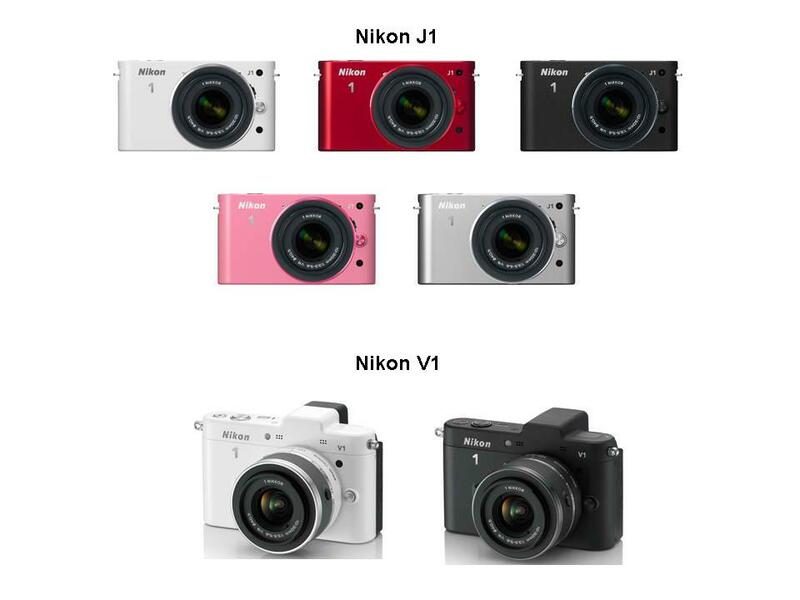 The only decoration on these flat, smooth cameras is the Nikon 1 brand name and the J1 or V1 model name on the front of the cameras. Positioning of a rear grip ensures a firm hold on the camera without sacrificing its simple, flat shape. What’s more, lenses are available in the same colors as the cameras* for an integrated appearance. The graphical user interface (GUI) adopted for monitor display is structured to be as simple and streamlined as the cameras themselves. Superfluous menus have been eliminated for an intuitive, easy-to-understand GUI design. Air-gapless structure adopted for LCD monitor with wide viewing angleThe J1 is equipped with a 3.0-inch, approximately 460k-dot TFT LCD monitor with wide-viewing angle, and the V1 offers a 3.0-inch, approximately 921k-dot TFT LCD monitor with wide-viewing angle. The monitors built into both cameras utilize an air-gapless structure with which the protective glass and LCD panel are integrated for a thinner design and increased visibility outdoors, enabling users to enjoy more beautiful display of their photos and movies. Short Movie Creator automatic movie editing software that is easy to use and can be launched independentlyThe Short Movie Creator software bundled with the cameras is an automatic movie editing application that is fun to use with still images and movies recorded with Nikon 1 cameras. It can be used to easily create original short movies with imaging effects (styles) and background music. Short movies created with Short Movie Creator can be saved to a memory card for viewing on the camera, or uploaded to online movie sharing sites such as YouTubeTM. In addition, collaboration with Nikon’s image transfer, browsing, editing and sharing software, ViewNX 2, enables easy organization and editing of still images and movies. Easily create original short movies from still images and movies by simply selecting an imaging effect (style) and music. With a maximum playback time of 30 minutes, three options are available: Summarize to fit to music, Use all images and movies, Summarize to manual length. Priority can be placed on the two seconds before and after a specific portion by simply selecting a “best scene”. A single movie file can be registered more than once for specification of additional best scenes. Music files can also be edited so that only a specific portion is used. The frame size and frame rate of short movies can be selected to suit the manner in which they will be used. Short movies can be saved to memory cards in a format that makes it possible to view them with the cameras. Bright, high-contrast electronic viewfinder with a resolution of approximately 1440k-dot (V1 only)The V1 is equipped with a bright, high-contrast electronic viewfinder (EVF) with a resolution of approximately 1440k-dot (SVGA). It is extremely clear with a frame coverage of approximately 100%, and utilizes a color filter system that prevents color breakup that appears as a rainbow artifact due to the interaction between subject movement and the photographer’s eye, for faithful display of moving subjects. *Windows is either registered trademark or trademark of Microsoft Corporation in the United States and/or other countries. This entry was posted in Brand: Nikon, Photography Articles & Videos, Uncategorized and tagged Lens, Micro 4/3, Mirrorless, Nikkor, Nikon. Bookmark the permalink.